"Touching down on mother earth, I take mud and turn it into pottery, lottery, i give all a chance, as i welcome all do the dance!!!" M. Franti | Everybody Ona Move from the album Yell Fire! I want to express my gratitude to everyone who has attended our concerts, film screenings, festivals or supported us in any way this year!!! This has been an amazing 12 months from last years Folsom prison thanksgiving to this year's harvest ball I have been inspired over and over again by all the amazing people i have met along the way. I have seen a big change as i have travelled around America in the last 6 weeks. People want change and they are beginning to speak out. 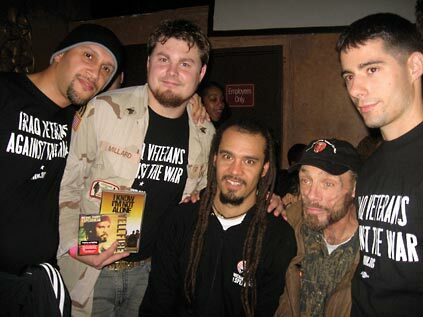 I want to send a special shout out to all the veterans I have met at all the shows and am very grateful that they have come out to tell me their stories and share them with our audience. Thanksgiving is traditionally a celebration of when the Puritan Pilgrims feasted with the Womponoag tribe. In the years following, the Pilgrims killed and forced the tribe off their land. The Womponoag went from half a million people to a remaining 750 today. I encourage you to contemplate this history as a reminder that each of us have an opportunity to further commit ourselves to social justice and healing the planet. Remember the best way we can show our gratitude for the abundance we have is by speaking up for those who cannot.